Our restaurant, lounge and patio provide an excellent retreat off the course. You can stop in for lunch, dinner, coffee, or a refreshing beverage before or after taking on our 18 hole course. 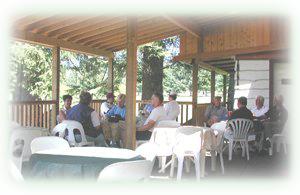 Our patio offers a wonderful view of the course and lets you enjoy the outdoor beauty of the Comox Valley. You can also stop in at the lounge to enjoy a beverage after your game.